BraceAbility’s medical socks for orthopedic walker boots are an inexpensive add-on that can make wearing any type of walking boot a more pleasant experience. Adding a sock to the equation helps reduce friction between the brace and your skin, which can help prevent any chafing or blisters. – NOTE: If you’re ordering a BraceAbility Walker Boot along with these socks, make sure to order a 1/2 size up to leave room for the socks. 1. One Size Fits Most: This universal sock fits men and women’s left or right feet, making it perfect for most adults and many children. 2. High Top: Wear this sock with almost any cam walking boot, regardless of your boots height. 3. Thick, Cushioned Knit Keeps Your Leg and Foot Dry: The overall superior knit quality of this sock creates a far more comfortable barrier for your skin, in comparison to most walker boot linings. 4. Non-Constricting Fit: Without feeling constrictive, the improved cross stretch fabric provides better compression to decrease the risk of friction and lessons the risk of your sock bunching. 5. Easily Washable Sock for Your Convenience: Unlike most walker boot socks and linings, you can wash this sock in your washing machine and dry on low heat for quick and easy cleaning. 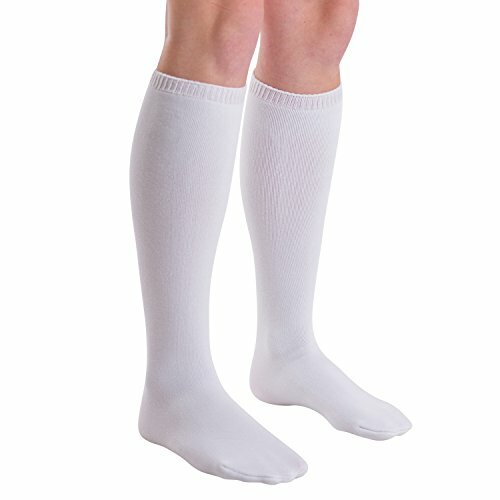 ONE SIZE FITS MOST: This universal, high top sock (19 inches tall) fits women’s and men’s left or right feet and is available in a single or 2-pack option. Compatible with short or tall walking boots. UNIVERSAL FOR ALL WALKER BOOTS & BRACES: Designed for use with all orthopedic walking boots, including post op surgical shoes, foot cast boots, closed toe medical walking shoes, air cam walkers, and air cast walker boots. USE FOR: These socks are intended to help reduce skin irritation while wearing a foot brace or walking boot. However, its mild compression also makes it useful for diabetes, leg fatigue, foot, ankle and leg swelling, circulatory problems, edema, and neuropathy. MATERIAL STAYS DRY TO ELIMINATE ODOR: This closed-toe, stretch tube sock is made with a cotton, polyester, lycra, and spandex blend. The latex-free, 100% synthetic fibers allow for superior moisture absorption to keep your foot and leg dry, while the thick cushioned-knit provides optimal warmth and comfort. NON-CONSTRICTING FIT: The improved cross stretch knit material provides targeted compression and heat retention to improve circulation around your sore foot, ankle, and leg, which reduces swelling and encourages blood flow to speed up your healing process.